© 2012 Sara M Novenson, Evening’s Flight,” Archival Pigment Print. The first thing you notice when looking at Sara M. Novenson’s paintings are the colors: Rich and vibrant, the blues, pinks, purples, reds and yellows invite you to peer closely, and whether you’re perusing her Great Women of the Bible series or her landscapes, the limited-edition work is striking. 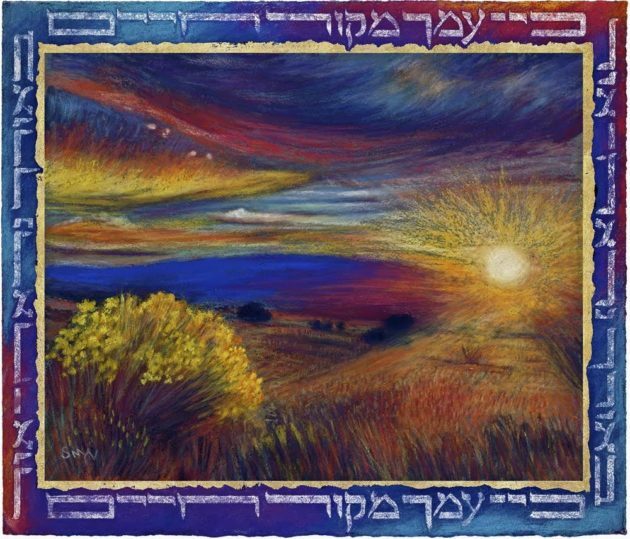 What’s more, most of Novenson’s art is bordered by hand-painted Hebrew letters—excerpts from the Psalms as well as blessings—that remind us to appreciate the miracle of creation. Collectors of Novenson’s work include actor Fran Drescher, the late musician Frank Zappa (1940-1993) and the Pratt Institute in Brooklyn, New York and she has had exhibitions throughout much of the world. Novenson has also run her own gallery on Santa Fe, New Mexico’s famed Canyon Road since 1996. A reviewer, writing in the Santa Fe Focus, describes her creations as “dazzling,” with “life-inspiring rays of sun and people shimmering with power and beauty.” But most notable, the reviewer wrote, is “the female energy and spirituality” each painting exudes. © 2012 Sara M Novenson. “Judith” from the Women of the Bible Series and the Book Illuminated Visions, Women of the Bible, Archival Pigment Print. As she tells Judith’s story, Novenson sounds both awestruck and proud. “Judith asked God to work through her and had the courage to take action. She used her mind to figure out what she needed to do. Maybe she was really afraid, but she did it anyway,” she gushes. Other women in the series are similarly powerful, she says, a dramatic mix of ferocity, fortitude, strength and sass. 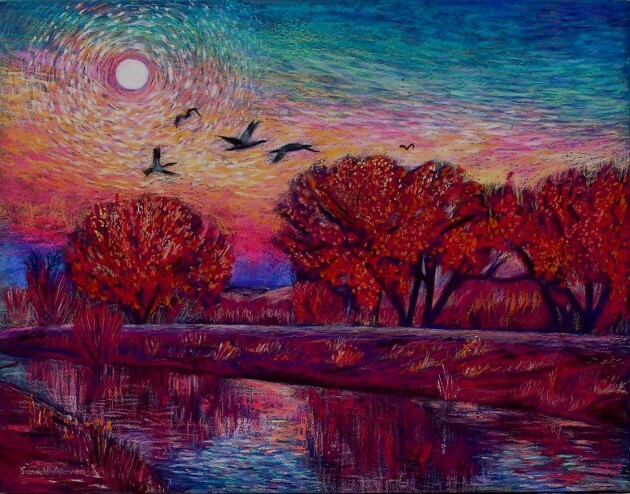 “Painting for me is a prayer of gratitude,” Novenson explains, and regardless of subject – whether she is depicting people or the world’s natural beauty – she says that her efforts bring her face-to-face with “the presence of God.” Particularly important, she says, is the light and color of New Mexico’s topography. A transplant – Novenson grew up in Teaneck, New Jersey and graduated from the School of Visual Arts in New York City – she fell in love with the US west as a five-year-old, when her family took a cross-country car trip to California that included a stopover somewhere in New Mexico. “Even as a kid, I knew I did not belong in New York City,” she laughs. In 1984, however, Novenson married a musician; when he got a job with the Radio and TV Orchestra of Cologne, Germany, the pair moved abroad. Although Novenson had been reared in a religiously observant family, it was only after she got to Germany that the need to make explicitly Jewish art became apparent to her. “It was weird,” she explains. “I’d walk into a restaurant for dinner and get these awful feelings. I’d later learn that the site had once been in the heart of the Jewish community.” She was also shocked, she says, to discover that many European Jews still kept silent about their heritage. Novenson eventually left her spouse, returned to New York, and, in 1992, kept her promise to herself by moving to Santa Fe. 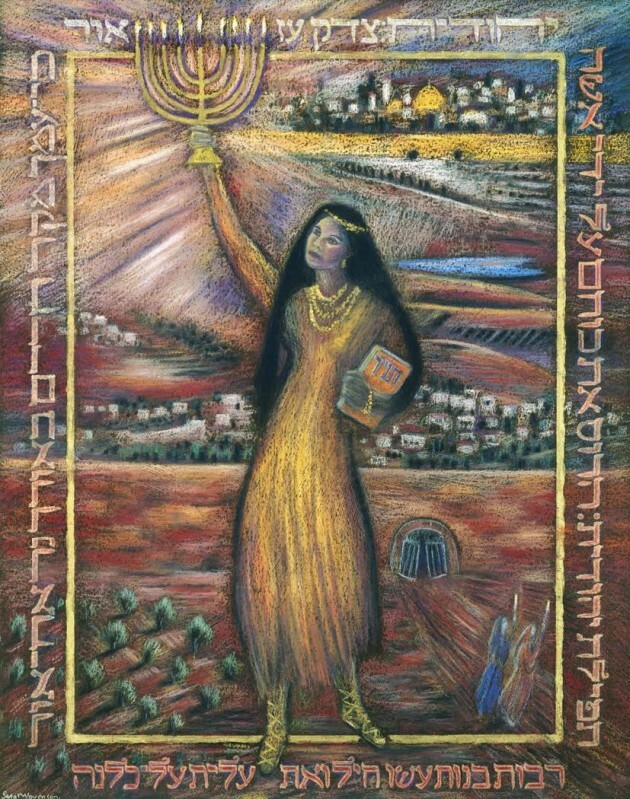 She has since immersed herself in study of Torah, Midrash and Kabbalah, an effort that has been incorporated into her paintings, illustrations and drawings. Art, she says, is her way of honoring the struggles and triumphs of her fore-parents. But she does more than this. Her lectures about Jewish art, folk traditions and Biblical heroines have taken her to every corner of the US – including churches and other non-Jewish venues. It’s clear that Novenson, now 61, loves juggling scholarship with creativity. Powerful and moving article. We often look to the present for powerful female role models, here was Judith thousands of years ago lighting the way! The orientation of art as seen by one who not only is an artist, but conceives and lives their life as one, forms the matrix of spirituality, compassion and intellectual curiosity of the unknown. Sara is of this breed.